Family Chenopodiaceae Vent., genus Axyris L.
Plant is 15-80 cm in height with taproot; almost entirely covered with stellate hairs,except upper side of leaves. It is usually branched in its upper part with slantwise-upward directed branches. Main stem is light green to white, much thicker than lateral branches. Leaves are numerous, ovate-lanceolate to narrow-lanceolate, long-pointed, entire, seldom somewhat serrated, often with slightly reflexed edges. Lower leaves have very short petioles, upper leaves are nearly sessile, main stem leaves are larger than lateral branch leaves. Plant is monoecious, inflorescences are pyramidal panicles. Flowers are very small with perianth consisting of three lobes covered with stellate and long hairs. Antheral flowers are straw-colored, densely clustered on the tops of stem and branches in the form of slim spiciform inflorescence, usually absent by fruiting. Pistillate flowers are green, solitary or clustered by two in leaf axils, usually situated below antheral flowers. Fruits are smaller than effuse perianth, flattened on both sides, obovoid or ovate, red or fulvous, glabrous, with or without bilobate winged appendage at apex. Winged fruits germinate readily while wingless seeds remain dormant for a long period. The plant flowers and bears fruits from July until September. A.amaranthoides propagates by seeds. Mongolia, Tibet, China, Japan; adventive plant in Australia and eastern part of North America. Within the Former Soviet Union the plant occurs in Western and Eastern Siberia, northern Kazakhstan, the Far East, Southeast of the European part. A. amaranthoides prefers clay and rubbly soils. A. amaranthoides infests grain crops, most abundantly millet. As a ruderal plant, it grows in waste grounds, lea lands, along roads, near houses, on waste dumps, hillsides and in river flood-plains. Control measures are skimming and autumn plowing. Golubintseva, V.P. 1936. The specific weeds of Siberia. In: Reverdatto, V.V., ed. Transactions of Biological Institute of Tomsk State University. V.2. Tomsk: Tomsk State University. p.170-227. (in Russian). Keller, B.A., ed. 1934. Weed plants of the USSR. V.2. Leningrad: AN SSSR. 244 p. (in Russian). Komarov, V.L. & Shishkin, B.K., eds. 1936. Flora of the USSR. V.6. Moscow-Leningrad: AN SSSR. 954 p. (in Russian). Nikitin, V.V. 1983. Weed plants of the USSR flora. Leningrad: Nauka. 454 p. (in Russian). Volkov, A.N., ed. 1935. Areas of distribution of the major weed plants in the USSR. Moscow-Leningrad: Publishing House of Kolchoz & Sovchoz Literature. 153 p. (in Russian). 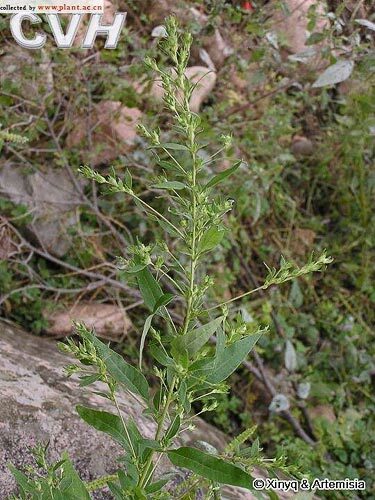 The image of Axyris amaranthoides is taken from the Internet: http://www.plant.ac.cn/dan_tu/57/45784.htm .